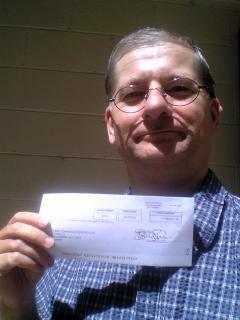 This photo is of my first cheque from Amazon.Com for selling products on my web site. In return for linking to Amazon from my web site, I get a commission on sales. This is not going to make me a fortune, but I wanted to see how it works as an example of e-commerce. Amazon provide facilities for showing products on-line, similar to Google's AdSense. But Amazon's systems seems less able to select products the customer would be interested in. I set the ANU students an assignment question to work out how to interface to Amazon's system to create a better service. The Amazon commission did not earn enough for them to send me a payment for about a year (they don't send one until it gets to $US100). But last October it started earning $US100 a day. This dropped back to a few dollars a day shortly afterwards and I never worked out what caused the spike. Banking the cheque from Amazon turned out to be difficult. Unlike Google, who send cheques in Australian dollars (and now have an electronic deposit option), drawn on an Australian bank, Amazon's was in US dollars. So I had to take it to a special counter at the bank. Amazon do not write on the cheque that it is in US dollars, nor that they are in the USA, which caused some confusion. The teller had never heard of "Amazon Services LCC" which made them suspicious. The address at a PO Box in "Incline Village, NV" made them more suspicious. From Google Maps, this seems to be a small settlement next to a golf course. Hi, I searching through Google on "my first amazon cheque" and found your site. How long does amazon cheque take to arrive to your country? I'm from Malaysia so maybe it quite same time of cheque delivery. Reading your post about how hard it take to cash the cheque make me nervous because I don't think my local bank have counter for US cheque although there was Western Union and cheque deposit machine.